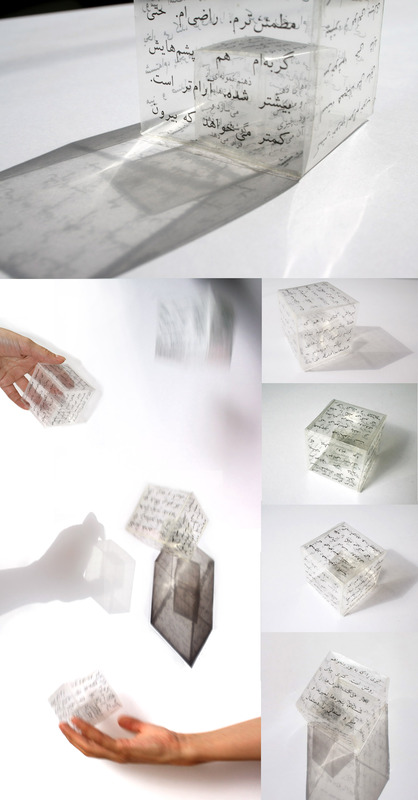 The outer cube narrates a man’s everyday thoughts, the inside cube his inner anxieties. Everything is the way I wanted it to be. I see the new leaves of the tree in front of my window and the cloudy sky illuminated with my favorite light. The kettle steams; I have washed the dishes, the windows are clean, the furniture is dusted. I enjoyed complete health last year, was not sick, not even for a single day. It was a very fine year. The weather was lovely. We expected much more cold. Less rain. I’m fine, doing well, very well, as before, or maybe even more. I have overcome the obstacles. Feeling more self-confident. Satisfied. Even my cat has become hairier. Calmer. Asks less to be taken out. I have also finished the book I was reading. I’m pleased. The new set of glasses goes very well with the rest of the utensil. I’m different from others in that, sound reverberates in me. Whatever enters my mind radiates to the walls and reflects back. Whatever I fear nestles within me and puts his head on his hands—his tail on his forehead. My mind makes replicas of my anxieties and puts them in a corner. Blood rushes to every single cell of my body; excitement fills my mind. If I light a cigarette, I feel it in my toes.